Delicious hot or cold, this vegetarian Roasted Eggplant Parmesan Sandwich won’t leave you hungry. 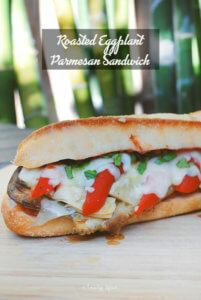 Keeping the picnic theme going, today I am featuring one of my favorites: Roasted Eggplant Parmesan Sandwich. 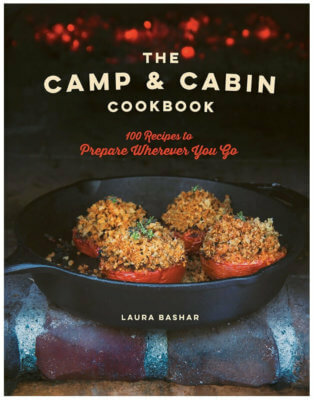 You are probably thinking, “Eggplant Parmesan? What’s the big deal?” Well, this sandwich is a lot healthier than the breaded-fried version, and it’s filled with a lot of great condiments that definitely kick it up a notch (or two or three!). Very rarely do I pan fry my eggplant. Eggplant is like a sponge and it soaks up a ton of oil. 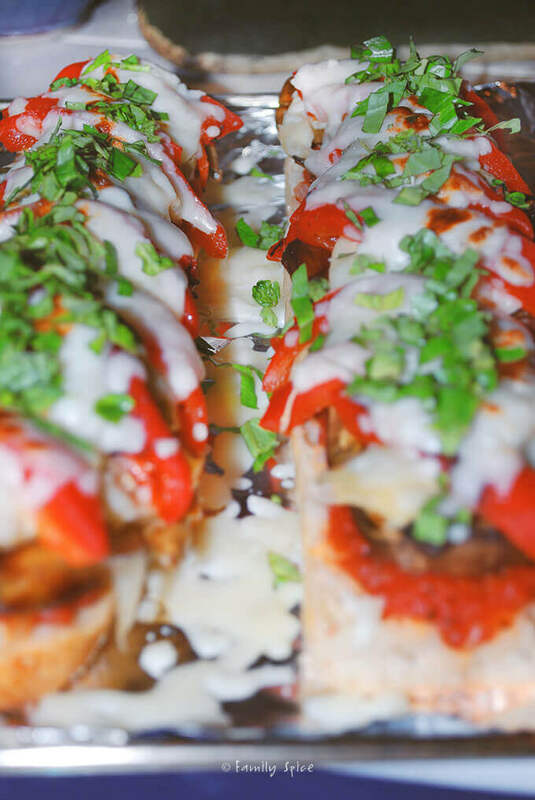 For most recipes, I bake my eggplant slices at around 385ºF for 20-30 minutes. And you only need a few tablespoons of olive oil that you brush on both sides of the eggplant. Now comes the fun part, assembling the sandwich! I like to use the French baguette. After cutting it in half length-wise, you start on the bottom half and work your way up. 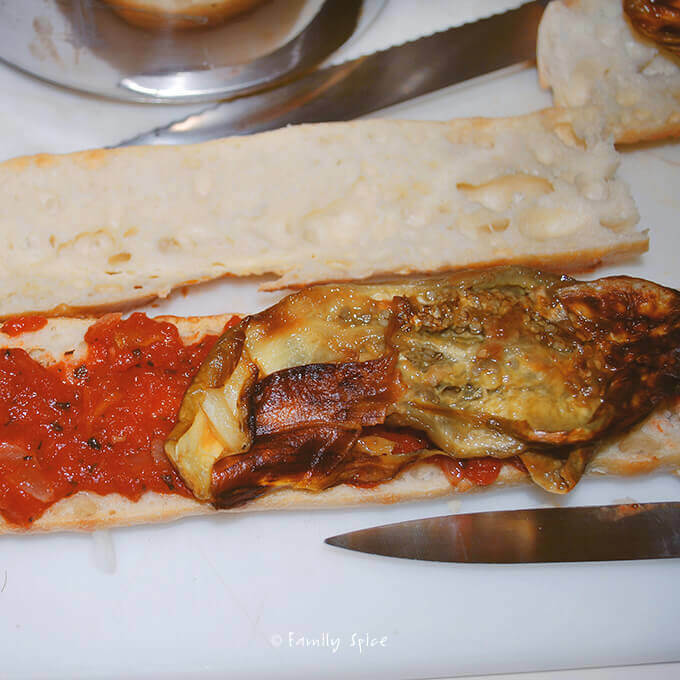 So, I generously spread marinara sauce on the bottom baguette slice, then layer the eggplant slices over the sauce. You can use your homemade marinara or store bought. 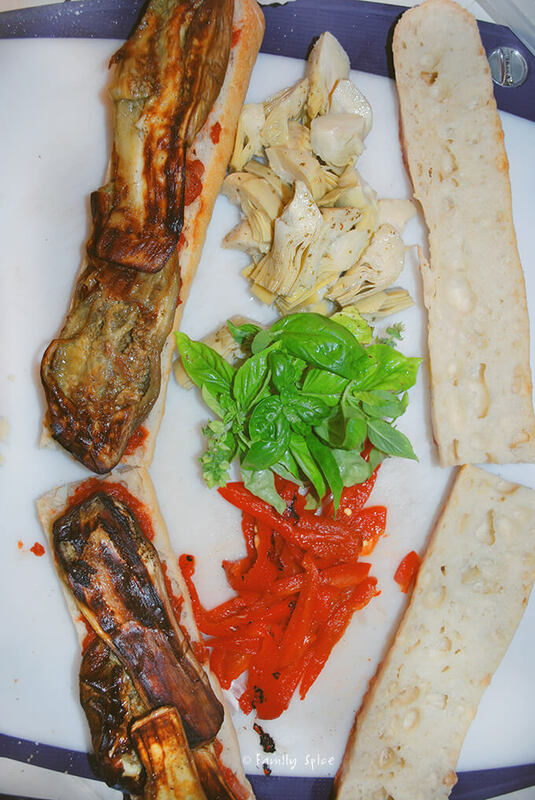 Add the toppings, in this order, over the eggplant: thinly sliced artichoke hearts, roasted red pepper slices (you can find jarred), then both parmesan and mozzarella cheeses. Place the sandwich on a baking sheet, with the top baguette on the pan next to the rest of the sandwich, and place under the broiler until the cheese melts. Remove the sandwich from the oven and add more yummies: sliced pepperoncinis, basil and drizzle some balsamic vinegar and extra-virgin olive oil. 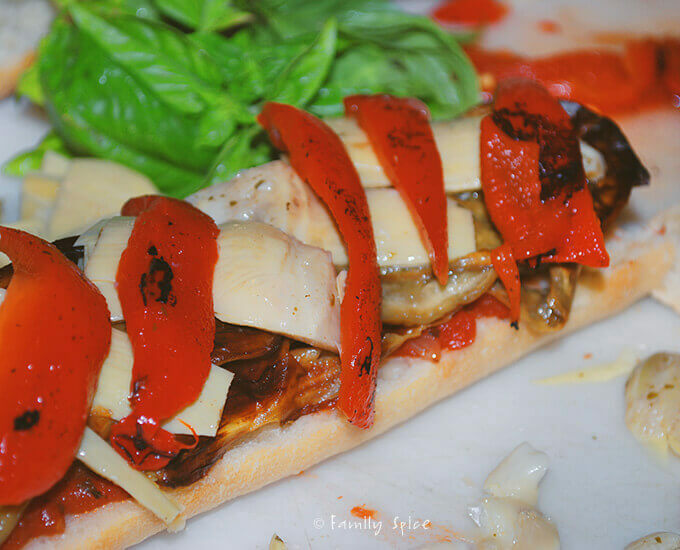 Finally, put on the top slice of your baguette and you are in heaven! This is a very satisfying sandwich and you won’t miss the meat! 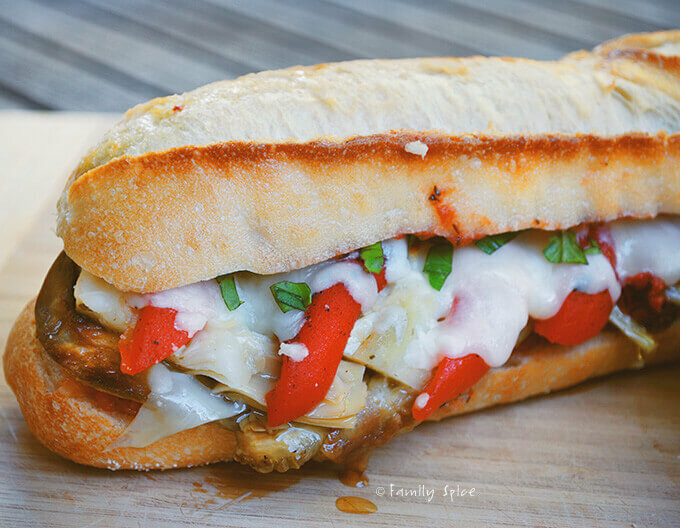 You could even replace the eggplant with grilled portobello mushrooms. Let eggplants sit for 20 minutes to sweat. Wipe excess water off eggplant using paper towels. Place eggplant onto broiler pan and bake for 20-30 minutes, or until top of eggplant slices start to brown. Place bottom halves of baguettes onto a clean baking sheet. Place eggplant slices over sauce, overlapping eggplant if needed. Place empty top halves of baguettes on baking sheet next to sandwich bottoms. Place in the oven and bake until cheese melts and lightly browns. Place top halves of baguette over bottom halves. Serving Suggestions: You can try it with roasted portobello mushrooms, too.